Lowry Avenue Community Works is a collaboration between Hennepin County and the City of Minneapolis to improve transportation options, offer housing choices and support business growth in the Lowry Avenue communities. In July, 470 people gave feedback about corridor planning for Lowry Avenue NE through an online survey. Of the respondents, approximately 72% live, work or own businesses along or near the corridor. Among residents who noted their neighborhood, 240 (or 51%) are from neighborhoods directly along the Lowry Avenue NE corridor. West of the Central Avenue intersection, respondents' first preference is for a roadway with a bicycle lane, with a second preference for wider sidewalks. For Lowry Avenue east of Central Avenue, the first preference was a buffered bike lane and the second, a bicycle lane. Survey responses about the six study intersections emphasized better signage for turn lanes and general wayfinding, improvements to building facades and streetscaping, wider sidewalks and redevelopment. The survey data will be evaluated along with additional community input received to date, in the decision-making process for final recommended roadway and intersections designs. Lowry Avenue Community Works had a busy day at the Central Avenue NE – Open Streets Mpls event. From our station at Central and Lowry Avenues, we shared information about corridor planning with hundreds of people as they waited to cross the intersection. People had opportunities to vote on roadway concepts for Lowry Avenue NE (see news item above) and share comments and ideas at the "big table," a 25-foot-long community conversation space. Meanwhile, kids redesigned intersections using crayons, pipe cleaners and play-dough. Go to hennepin.us/lowry to see the roadway concepts for yourself. Hennepin County is hosting a third and final public workshop dedicated to the Lowry Avenue NE plan: Join us on Thursday, September 25 from 6 p.m. to 8 p.m. at East Side Neighborhood Services, Inc. The Community Works team and partners will share information on final design recommendations for street design, intersection concepts, redevelopment opportunities and streetscape design. In order to provide residents with a way to get rid of unwanted batteries, thermometers, drain cleaners and a host of other household chemicals and hazardous products, Hennepin County organizes an annual series of community collection events. If you missed Northeast Minneapolis’ community collection event earlier this month, head to the University of Minnesota campus September 18 to 20. Materials will be collected on from 9 a.m. - 4 p.m. each day at Parking Lot C66 at 2904 Fairmount St. SE, Minneapolis. Materials are accepted for free from households only. Businesses must manage their waste properly. For a full list of accepted materials and directions, visit hennepin.us/collectionevents. Items can also be taken year-round to drop-off facilities located at 1400 W. 96th St., Bloomington; and 8100 Jefferson Highway, Brooklyn Park. For more information, call 612-348-3777. Did you know that Hennepin County offers grants of up to $50,000 to help businesses manage their waste? 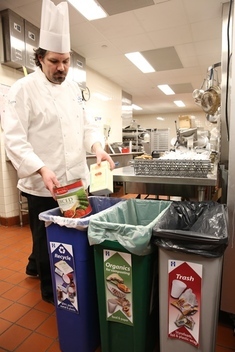 Funds can be used to start or improve programs to increase recycling and decrease food waste. From large office buildings to small churches, restaurants and apartment buildings, most county businesses and non-profits are eligible to apply. Grants can be used for the purchase of containers and equipment, installation and hauling service charges and minor improvements to loading docks or waste enclosures. Applications for the final round of grant funding for 2014 are due by October 15. Get more information at hennepin.us/businessrecycling or call 612-543-1316.